Dessert franchise system Sweet Jesus has expanded into Mississauga, Ont. 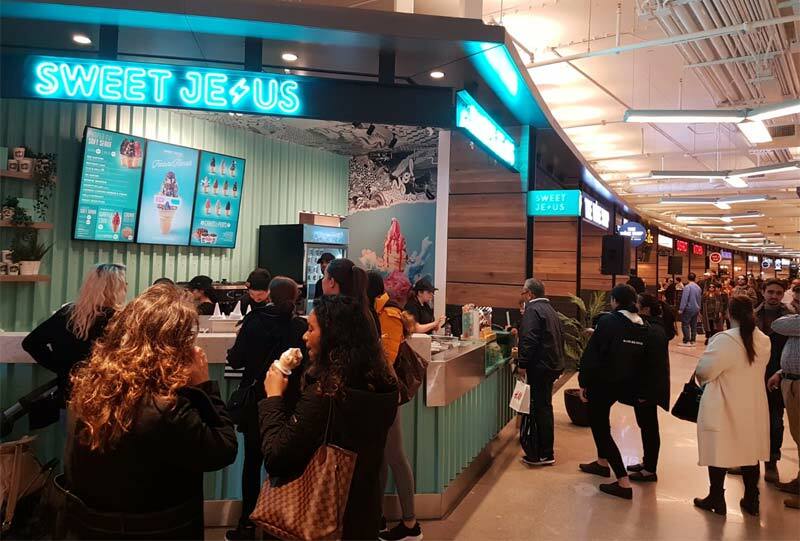 Mississauga, Ont., recently welcomed its first Sweet Jesus franchise, located within Square One Shopping Centre’s new Food District. Founded in Toronto in 2015, the dessert franchise system is owned by Holy Sweet Inc., which is an affiliate of International Franchise Inc., the franchisor for international brands Yogen Früz, Pinkberry, Swensen’s, Yeh! Yogurt, and Yogurtys. “I would like to personally congratulate our franchisees Larry, Sheelah, and Paul, as well as the International Franchise Inc. team on this exciting achievement,” said Jeff Young, president of International Franchise Inc.
Sweet Jesus features hand-crafted soft serve ice cream, with flavours such as Cookies Cookies Cookies and Cream, Bangin Brownie, Rocky Road Rage, Birthday Cake, Hella Hazelnut, Oh Hungry, and Red Rapture.